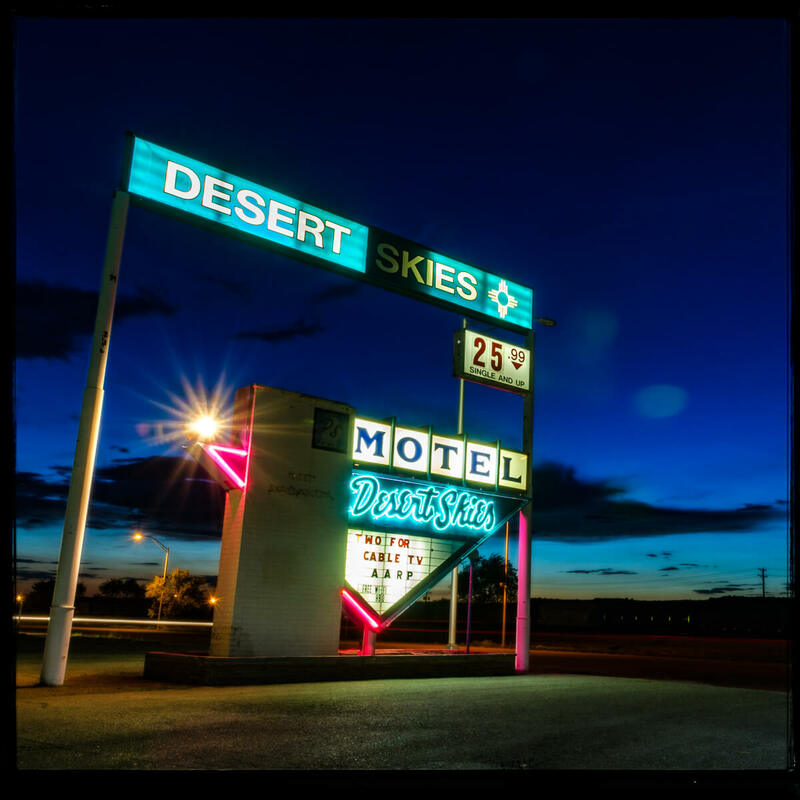 As you drive through Gallup, it is impossible not to be welcomed by a heaping helping of vintage neon signs on cafés, motels and trading posts, all on display as you motor west through this visual town. In many ways, this makes Gallup a stay-over destination for those seeking to view and capture these unique monuments to an earlier time, in their prime time, golden hour of dusk to the dark of night. So, make sure that you have lots of memory on your camera. Back in 2012 on a southwest tour of the old Mother Road, I noticed a signature southwest cloud structure forming as the sun was sinking low. The upward rays of sunlight were starting to beam over the clouds. Recollecting the treasure trove of monumental neon approaching on the west side of Gallup, I knew I would soon be making some great captures. I made a right turn into the parking lot of The Lariat Lodge, parked the car and captured these two images of The Lariat and The Blue Spruce. Satisfied, I continued west, to my next stop, the Desert Skies Motel. The venue’s unique googie sign caught my eye back in 2004, but preceding visits had not been fruitful, due to bad lighting. Arriving at the Desert Skies the sun was still working it’s way below the horizon. I knew that I wanted to pause until civil twilight to create this image in order to get a nice transition of blues and cyans to create a color harmony with the sign and the sky. Feeling I had what I needed, there was just a little time left of civil twilight so I jumped back into the car and headed to Richardson’s Trading Post, just in time to capture the last bits of afterglow to create this image on the empty Gallup streets. 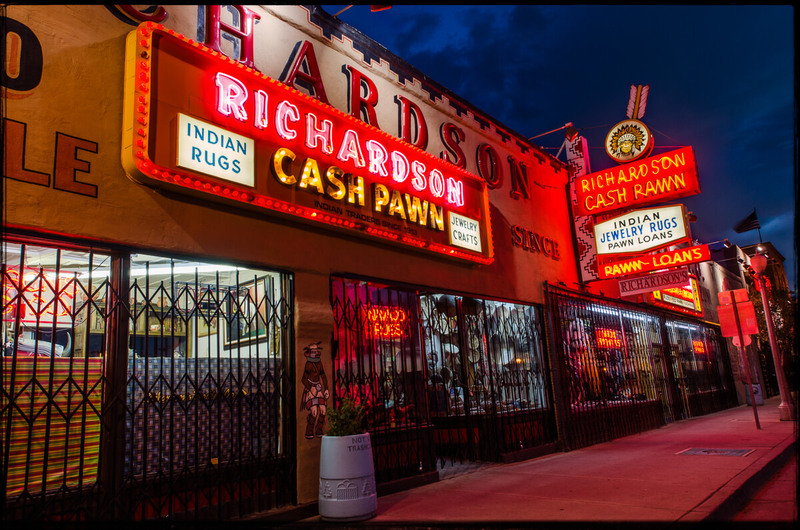 Richardson’s Trading Post is one of those special places along the route that you want to make sure to visit. This particular trading post is sprawling and carries a large selection of Native American-made and traded head dresses, rugs, kachina dolls, weavings, pottery and more. It’s a very interesting place to lay eyes on. In this day and age it’s not too often that one finds a new car dealership beaconing it’s customers with a classic sign, however, the Gurley Motor Company does just that. 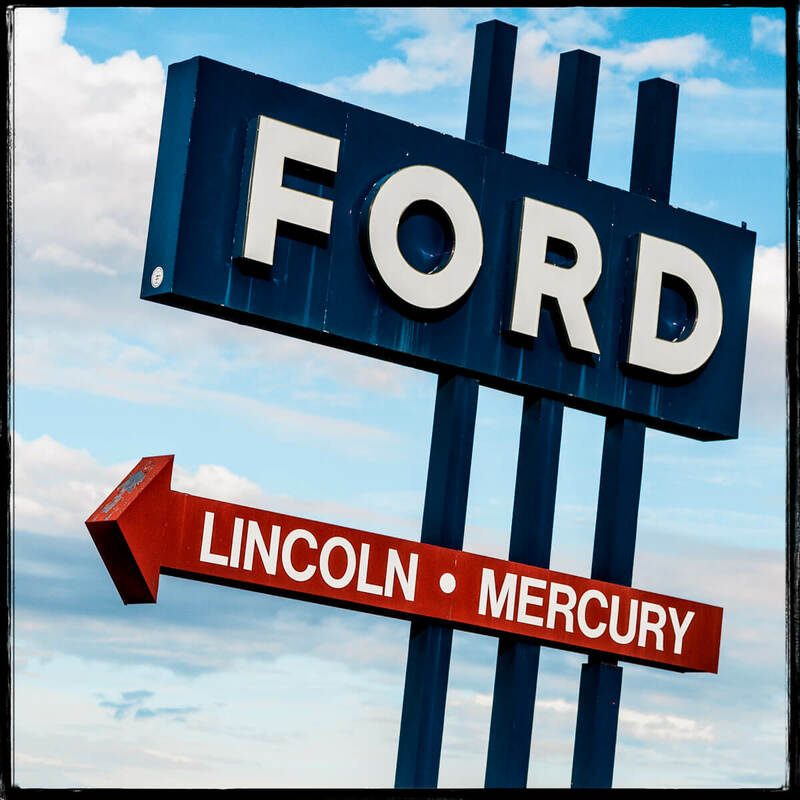 This Ford sign stands on Old 66 West, directing customers one block to the south to their dealership on West Coal Avenue, which at one time was an earlier alignment of Route 66. At the end of a long day of adventure on the Mother Road that ends in Gallup, my first choice to dine and rest for the night is The El Rancho Hotel. This landmark venue offers an experience like few others on Route 66. 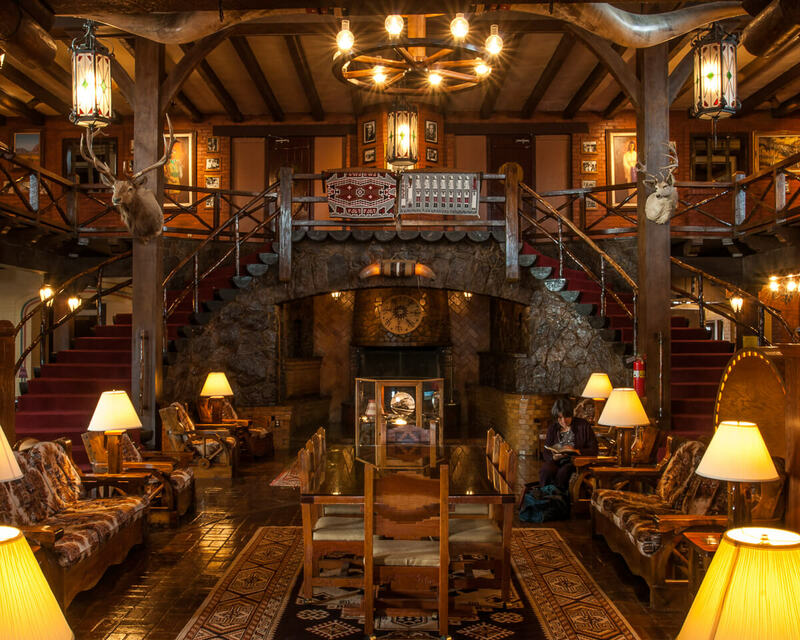 In the days when Westerns were a popular movie and television genre, this hotel was the preferred stay for movie stars filming in Monument Valley and the surrounding Gallup area. The lobby is warm and inviting, the feeling is timeless. A walk though the hallways presents you with 8x10 black and white glossies of the long list of Hollywood stars that have graced this establishment and fine Native American Art. Keen to enjoy other amazing pictures of Route 66, pop by www.picsonroute66.com, and make sure to check out David Schwartz’ brilliant wooden panels.